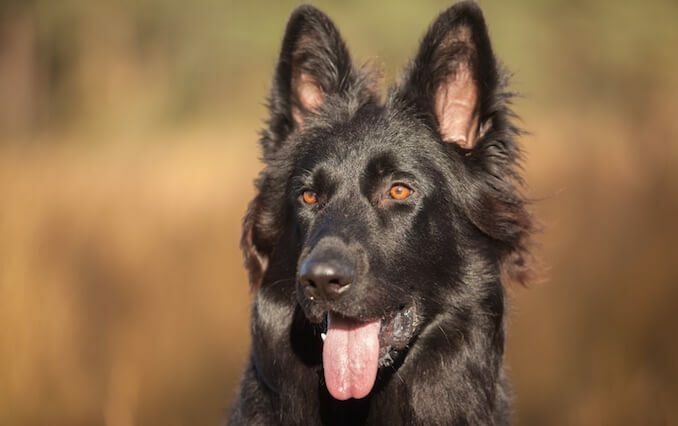 Some people think the Black German Shepherd is a result of a defect in the breed. Some think the dogs are a cross breed. We’re here to tell you, those are myths. 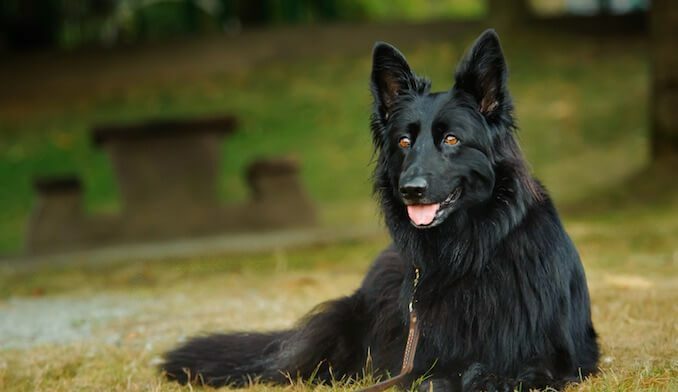 The black color is recognized within the breed standard of the German Shepherd Dog. Although relatively rare, they are gaining more and more popularity, mostly thanks to the straighter back on these fearless, loyal comrades. Originating in Germany, the German Shepherd Dog (“GSD”) was a result of many herding dogs being selectively bred to produce the perfect working dog. The GSD has lived up to its purpose; boasting years of service in the military, police and other support services. On returning from the first world war, soldiers spoke of its valor! 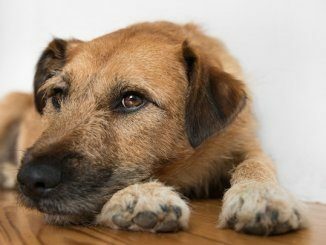 In this article we will consider the traits and temperament of this loyal breed, their history and how to care for them on a day to day basis so you can decide if they are the perfect dog for you. The All Black GSD is a large breed dog. The males will weigh in between 65 – 90 pounds and stand up to 26” tall. The females always slightly smaller, will weigh anywhere between 50 – 75 pounds and stand no taller than 24”. 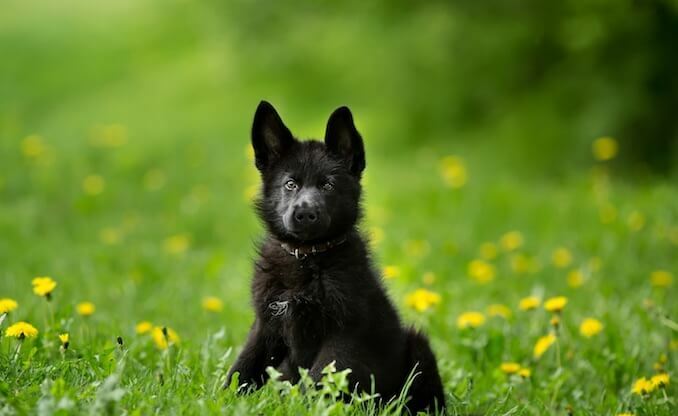 The Black German Shepherd is not a separate breed, it is a purebred that just happens to be solidly black in color. They therefore have the same general temperament. 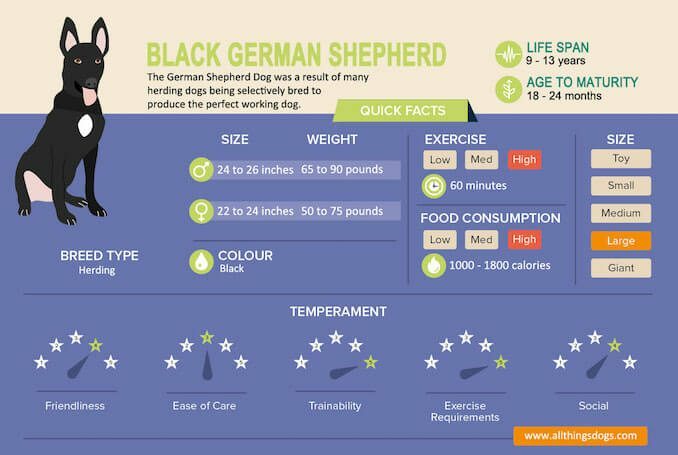 Free Guide: Download our free Black German Shepherd eBook for everything you need to know about this breed. They are loved for their protective and loyal nature. They are intelligent and trainable; being the most widely used breed in the police, military and in search and rescue efforts. A Black GSD is as a result of breeding two black GSD’s, or it is possible for a black and tan GSD to give birth to a black GSD puppy. The difference is black GSD’s are black from the moment they are born. The GSD is a recognized breed by the American Kennel Club and the black color is recognized in their breed standard. Black German Shepherds, because they are more rare than standard colorings can be more expensive. For a standard GSD you can expect to pay anywhere between $300-$700 for a puppy. For the Black GSD, you can spend anywhere from $700-$2000 per puppy… not cheap. Litters range in size anywhere between 4 and 9 puppies. As we’ve previously mentioned – you’ll know a black GSD from birth, whereas standard GSD’s develop their colorings by around 8 weeks old. Let’s have a look at where these active and obedient guys came from. Stable and stoic, the black GSD is a loyal comrade. They are protective of their family and can take time to get to know strangers. Active enough for those mountain hikes but will equally crash out at the end of a busy day. Most people know the GSD as a herding dog and as it’s name suggests; it’s origins are in Germany. There were a range of herding dogs in Germany in the 1800’s; German cavalry officer, Captain Max von Stephanitz wholeheartedly believed that dogs should be bred for working. He was impressed with the strength and character of the existing herding dogs, but did not believe the perfect herding dog yet existed. In 1899 he attended a show where he purchased Hektor Linksrhein – later changed to Horand von Grafrath – a dog who would later become the first named German Shepherd Dog. The first appearance in the US was thought to be in the early 1900’s – a female named Queen of Switzerland. Unfortunately, when breeding, her offspring suffered many defects which resulted in a decline in popularity in the breed. Shortly after the first World War, popularity of the breed also declined due to their German association. The UK Kennel Club renamed the breed “Alsatian” in a hope to quiet the ill-association with the war. Only recently in 2010 returning to the original name; German Shepherd Dog. The GSD has also been subject to scrutiny in recent years after a GSD won Crufts in 2016. Spectators were shocked at the poor form demonstrated by the winner – showing significant flaws with the breed standard. The UK Kennel Club issued a statement committing to rewrite the breed standard for the GSD in order to promote good health and form. The Shiloh Shepherd is an attempt at breeding a new breed to remove these health defects. Despite having a controversial past – the German Shepherd ranks an impressive 2 out of 194 for popularity according to the American Kennel Club. The black GSD is as a result of breeding two black GSD’s or simply having two bi-colored GSD’s mate, producing a range of colored puppies. Let’s have a look at him in a little more detail. Sometimes misunderstood – German Shepherds (i.e. Alsatians) are thought to be guard dogs. Whilst these working dogs can be trained to protect, they don’t warrant the negative press they have received. These guys are incredibly family orientated and will be a devoted member. 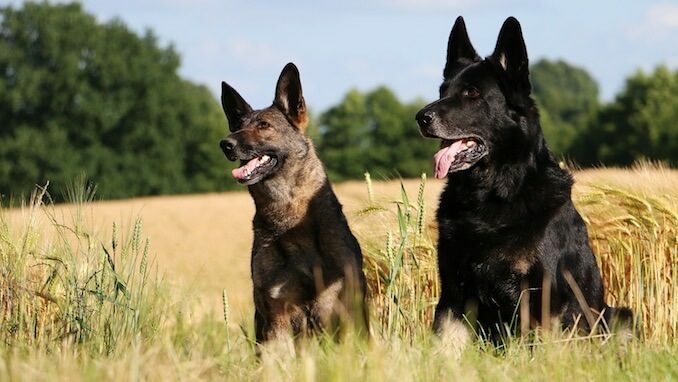 Black German Shepherds are loyal, stable and courageous. If trained properly and socialized from a young age, they will happily keep a watchful eye over baby whilst they are sleeping and equally play ball in the yard with the teenagers. They perceive their job is to protect their family – which they will do, and do it well. They are alert and watchful and will bark to let you know something is amiss… even if you’ve accidentally left the bin in the wrong place! They can also take time to get to know strangers; once they have accepted you, you are their friend for life. Being so family orientated, they dislike being left alone. They can become incredibly stressed and anxious; resulting in destruction and barking. 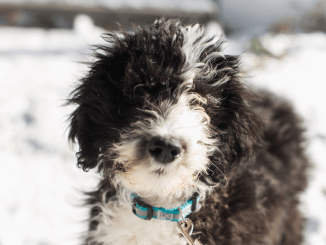 They are a strong and powerful breed – not particularly suited for first time owners or those who don’t understand their needs. If trained and socialized from a young age, by someone who understands working breeds, you will have a perfect family dog! They have a pretty good life span for larger breeds, you should expect your guy to hang around for 9-13 years. Most owners feed their puppy GSD 4 meals a day. This is particularly important in the larger breeds as they are most predisposed to bloat, this is where the stomach becomes bloated and twisted and is usually fatal. At around 6 months old, owners tend to reduce to 2 or 3 meals a day; most adult dogs maintain 2 meals a day. Manufacturers often have specific large breed foods. What is more important is ensuring that the food you are feeding meets the daily nutrient requirements for your pooch. It is advised that when fully mature, dogs require 1.19 grams of protein per pound of body weight and 0.59 grams of fat per lb of body weight. Carbohydrates, although important to your dog’s diet, are less of a priority, so ensure your food doesn’t contain endless cereal fillers. A good way to check for this is in the ingredients list. The ingredients will be listed by quantity. So the first ingredient is the highest quantity, the last ingredient on the list will be in the lowest quantity. Try to find a food which labels a meat as the first ingredient. A large breed will use around 20 calories per lb of body weight. If your guy weighs in at 80lb, then expect to feed around 1600 calories per day. Use the feeding guide below for the range of calories you can expect to feed your GSD. Most food manufacturers will include a feeding guideline with their food which will include daily amounts based on the target weight of your dog. Monitor your dog’s weight by physically checking for his ribs and that you can see a waistline. Any concerns with his weight – pop to see your vet. They are a working dog from herding origins who require regular exercise. They will happily hike up mountains, go swimming in the river, play in the dog park or play ball in the yard. You will always be able to find something to keep your comrade active. These guys are highly active and require upwards of 60 minutes exercise per day. Due to their high intelligence, they excel in brain games. Split some of his daily food allowance so you have a handful of kibble. Grab three kitchen towels or hand towels. Tie the towels together at one end. Braid the towels into a relatively loose plait. Tie at the end again. Slot the kibble into the plait; at the cross overs and where the towels have twisted. Give to your pooch – he will spend ages snuffling at the towels to get at the kibble. These guys thrive with a consistent routine; positive reinforcement and reward will have them eating out of the palm of your hand. Incredibly intelligent they need daily exercise along with mental stimulation. 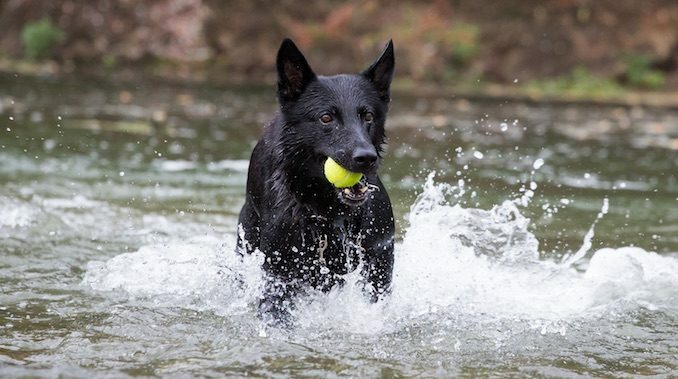 The Black GSD is a highly intelligent breed which makes them extremely trainable – in the correct circumstances. To ensure you have a stable, well-rounded protector, you will need to socialize from a young age. Here we are talking about showing her what the world has to offer. Introduce her to all sorts of people, short people, tall people, those wearing hoodies, those wearing hats, cyclists wearing helmets, all of it! She needs to see and hear those loud machines; farm machines, refuse wagons and tankers. She needs to meet children, of all ages; she needs to learn that when they are getting a little irritating, she can just take herself off to a safe place and she won’t be hassled by them. When she is responding how you expect a stable dog would, reward her! Positive reinforcement and rewards are essential for these guys! We know that these techniques are much more effective when training dogs; punishment is known to cause problematic behaviors in dogs. Reward her with toys or food. Praise her verbally and physically – a pet or a good scratch behind the ears! 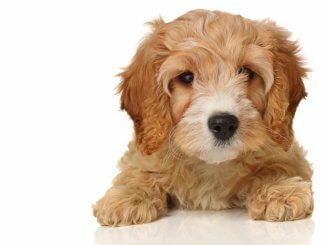 Those puppy months are vital in developing a sound dog so ensure you tackle the training straight away. They are never too young to start! The medium coated guys come in relatively low on the grooming maintenance scale; you could easily maintain their coat with a twice weekly brushing. The long coated guys will need daily brushing though; to prevent knots and tangles forming. They have double coat, which will shed. You should expect two “blow outs” per year, with reduced shedding the rest of the time. But if we’re honest, all us double coated breed owners know, you still need to vacuum twice a day most days! Most owners will visit a grooming salon for a bath and dry package between 2 and 3 times a year. Over bathing a double coated breeding can strip their coat and dry it out. A groomer will advise you on the best schedule for your dog. Check their ears regularly – as they stand erect on their heads, they are more likely to catch dust and dirt. Starting grooming from a young age is all part and parcel of their socialization too. 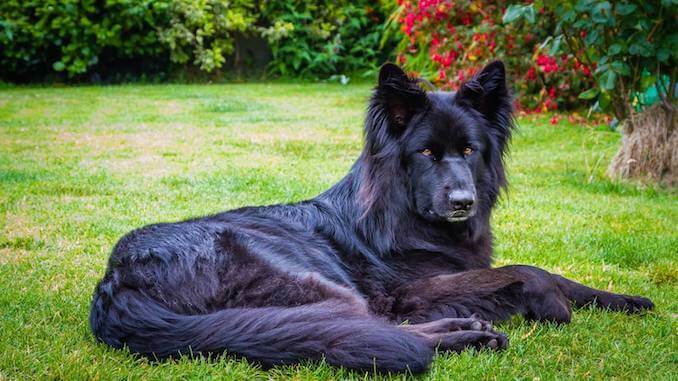 The black GSD is solid in color. Often presenting with a straighter back than typical GSDs. They are large and striking. Presenting with either of two coat types – medium and long. As we’ve mentioned the black GSD will present with either a medium or long coat. They are both double coats, having a more dense guard layer with a softer undercoat. The black GSD is a solid black color. They have a domed shape head with a long, square muzzle. Their ears sit erect on their head. They have long necks, which sit low when running or prowling. They are large, majestic and powerful. 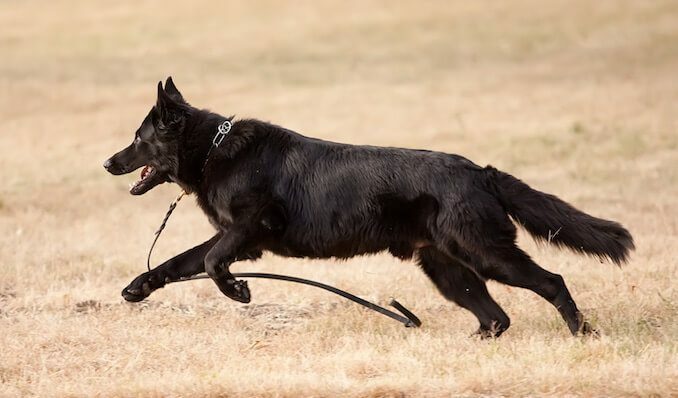 They look very similar to a standard GSD, but it has often been found the black GSDs have straighter backs so they are avoiding some of the controversy with the breed. Despite this, we know that they do suffer with a lot of the same health issues. Hip dysplasia – Abnormal development in the hip can result in a dog’s hips weakening and deteriorating, often becoming arthritic. It can range from mild to severely disabling. We know it is a common problem in large breeds due to their rapid growth when they are puppies. It can often be managed through alternative therapies and medication, however, often surgery is needed. CDRM – chronic degenerative radiculomyelopathy, more recently renamed as canine degenerative myelopathy (DM), is a disease of the spinal cord which causes nerve cells to fail; this results in hind leg paralysis. Osteoarthritis – this is a degenerative joint condition which is painful and can result in loss of movement in joints. Treatment is available, both medication and surgery. Cauda equina syndrome – this is another issue affecting the back. Here the nerves are compressed resulting in lameness, stiffness and pain along the back, in the hips and tail. As with any large breeds, it is advised to check the hip scoring of parents when considering a puppy. Any dogs presenting with a high score should not be bred from. It is also essential to regularly visit your veterinarian for annual physical examinations and to maintain their vaccination schedule. If trained appropriately and socialized early you will have a courageous, stable, well-rounded protector. They are highly intelligent; not surprisingly used so widely in the military and police. Returning soldiers can’t speak highly enough of them. They are incredibly active, so expect upwards of 60 minutes of exercise per day. They thrive on brain games, don’t be surprised by any of their performances. These guys certainly know how to keep you on your toes. But when all that is said and done, they love nothing more than curling up on the sofa at the end of the day. They adore their family; from babies to teenagers. Give them what they need and you will have a perfect companion let us know what you think in the comments below. We are so glad because it keeps her very busy. I have had GSD my whole life. Would love to find a reputable breeder of the black GSD. Can you tell me the name/location of the breeder you used? Research the german shepard man he has a website as well as training videos on you tube, he breeds black GSD and he is a great knowledgeable Breeder. Hope this helps! We adopted our male long hair in 2012..approximately 2 years old..absolutely love him..big easy going guy. I have a black female 8 months old. She is extremely smart and rotten to the bone. She is a huge part of our family. I’m 68 years old and have been around and owned several dogs. This dog is one of the smartest I have ever seen. Interesting article! I have an 11 year old Black Shepard, who’s retired from the Marine Corps. She doesn’t sniff for bombs anymore, but she’s my baby and I love her! Highly recommend to anyone who loves dogs and is looking for a true companion, more than a “pet”…. They can give more to you, than you can to them! Our beautiful black GSD O’B died last year at 10.5 years. He was stunningly beautiful, wonderful temperament, made friends wherever he went–human and dog alike. We miss him terribly. Best dog I have ever known. I am interested in adopting a male or female pure black German Sheppard. I would like your help me connecting me with a good breeder. Hi Michelle, our editorial team is currently collecting a list of reputable breeders with the aim of publishing a list in the future. If you subscriber via email, once the list is ready you will receive an email with the breeder details. This was a very informative article. That sounds great thanks! Im looking for black german shepherd breeder.please send me a list of breeders in nj when available. Hi Andy, our team at All Things Dogs is currently collecting a list of known breeders for GSDs, this includes black GSDs too. We will be in touch once the list is ready.